Dosa is the typical south Indian pancake that is generally made with par-boiled rice and split black gram. However, dosa can be made with different combinations of cereals, pulses, millet and their derivatives. 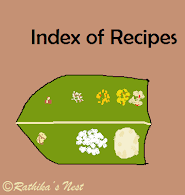 So far, I have uploaded ten different dosa recipes on Rathika’s nest. Today, I intend to share with you three more dosa recipes. Rice dosa (பச்சரிசி தோசை) is made with raw rice alone. As it does not require fermentation, you can make the dosa immediately after grinding the batter. Rice dosa is thin, soft and filling. It goes well with coconut chutney or with ‘thengai pooranam’ (தேங்காய் பூரணம்) made with jaggery and coconut. I shall share ‘thengai pooranam’ recipe on this platform shortly. How to prepare the batter: Wash and soak rice in 3 tumblers (600ml) of water for four hours. Later drain and grind the rice with required water into a very smooth paste using the mixer-grinder. Add salt and more water to make the batter into thin pouring consistency. Please note that the batter should be as thin as rava dosa batter. DO NOT let the batter to stand. Make dosas immediately. How to make the dosa: Mix the batter well before making dosas. Heat the dosa tava on medium flame. Once hot, pour a large hollow ladleful of batter on the tava along the edge. Slightly tilt the tava from side to side so that the batter spreads evenly around (Fig1). Fig.1: Pour the batter along the edge of the tava. Pour oil around the dosa. Cover with a lid for 10 seconds (Fig.2). Fig.2: Cover the dosa with a lid. Rice dosa being very thin, cooks fast. Once cooked the edges separate from the tava. Carefully remove the dosa and turn it over. Remove it immediately from the tava. DO NOT allow the dosa to brown. Rice dosa should be white and soft. Serve hot with coconut chutney or ‘thengai pooranam’ (தேங்காய் பூரணம்).